This recipe makes a tiny cocktail, so to get a more normal sized drink you would probably want to at least double this, if not triple it. It pretty much ends up being a shot of Irish whiskey with a twist. It has a sweetener and some bitters, so it has the classic cocktail parts, in a shot glass. Savoy/Café Royal have a garnish of an olive and an orange twist. I had actually run out of curaçao (gasp!) but since this was just a dash I subbed in some orange tincture. Simple and tasty. 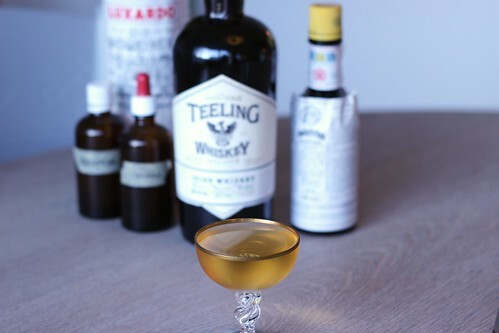 I like the Teelings whiskey straight up and the subtle mix of flavor and sweetness from the dashes is quite nice. A nice way to enjoy your whiskey shot.